Lawn Care is releasing their debut album 'Replacement Therapy" on CD and Vinyl through A-F Records and are celebrating at The Glitter Box Theater with friends and family! 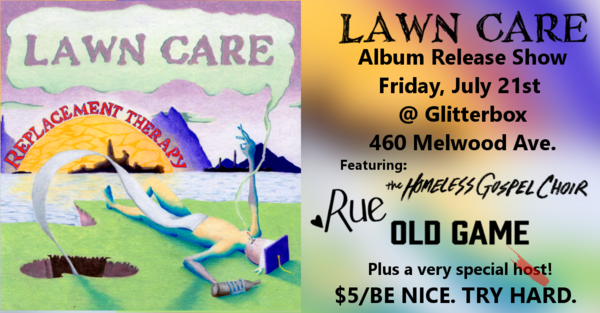 Lawn Care's album "Replacement Therapy" is 12 tracks of high-energy punk music about attempting to age gracefully in your 20's despite the challenges presented by mental health, romantic relationships, inebriants, higher education, and capitalism. All songs written and performed by Cameron LeViere on vocals and guitar, John Paul Zigterman on drums, Harrison Thurman on bass, Matt Very on saxophone, Ryan Ruff on trumpet, and Omri Barak on trumpet. Recorded, mixed, and mastered at Very Tight Recordings. Album artwork by Louie Corpselyf Demarco. The Glitterbox Theater is a new venue in the North Oakland neighborhood of Pittsburgh dedicated to creating a safe and accessible space for all sorts of events. A huge "Thank You!" to the many many people involved in making this album and this event! !